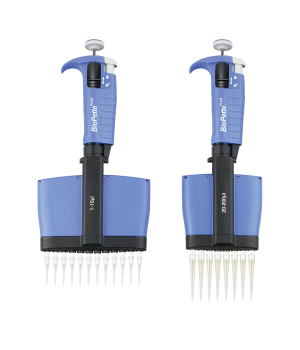 Ideal for all standard 96 well formats, the BioPette™ Plus Multichannel Pipettes stand up to the wear and tear of constant use while maintaining excellent accuracy and reproducibility. 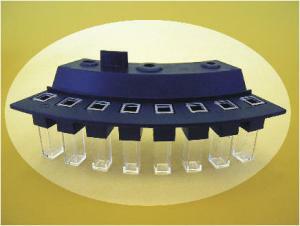 Four overlapping volume ranges are available to precisely meet liquid handling requirements from 1 μl to 300 μl. The ergonomic handle fits comfortably in either the right or left hand and has a slightly recessed volume adjustment wheel with volume lock to prevent accidental change. Volume setting can also be accomplished by turning the push-button. 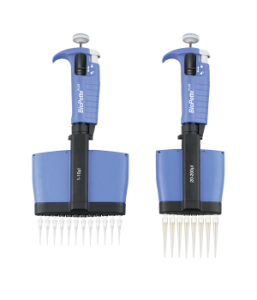 The BioPette™ Plus Multichannel pipettes offer reduced pipetting forces. 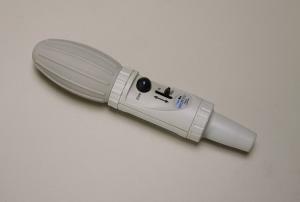 The manifold rotates 360º for comfortable pipetting in any direction. An individual piston suspension system allows even sealing of tips across all channels without rocking the pipette. The curved ejector design pushes the tips off in steps, thus requiring minimal force to operate. Each channel has an independent, precision piston assembly to ensure accuracy and reproducibility from one pipetting series to the next as well as between channels. Four volume ranges are available as both 8 and 12 channel models. 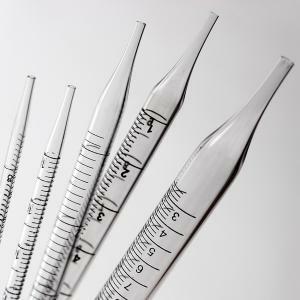 Each large capacity multichannel pipette is individually tested and supplied with a certificate of quality and a calibration key. The BioPette™ Plus multichannel pipettes are fully autoclavable.